Hideki Nagaishi: I would like to hear a story on the business side. It costs a lot to make animation. If possible, could you please let us know how STUDIO 4°C gathers the budget for each animation project? Eiko Tanaka: I gather the budget by convincing potential business partners one-by-one, steadily, and every time it is a very hard job for me. STUDIO 4°C is a creator-driven group, which is specialized in preparing opportunities for the creators to show their ability, and making only animation which would make all the creators think, “Yes, this is a worthy and meaningful thing to animate and put it into the world”. As a result, we tend to make an animation of our original story, or an animation based on an unknown masterpiece, not a famous and popular title. It is very difficult to gather investors for such a project because it is not an animation directed by a big name and follows the market trend. STUDIO 4°C is not a studio which develops TV series on a regular basis, so we are not rich in budget for animation production. Regarding to the procurement of funds for each title’s production, we always walk on a tightrope and just barely manage to succeed. For example, we needed more than three years to complete a short pilot film and image boards of the Mind Game after we started the film project by gathering money steadily and developing the visuals, little by little. Then, I went back to business gathering the budget for the film with those visuals. I hand-picked people who fell in love the work through years of tireless work. There is a scene in the original Manga of Tekkonkinkreet where an elderly person is being hit by a character with a metallic pipe. When I was looking for investors, some of people who know the original Manga said, “We can’t invest in a film based on a Manga which has a scene like that”. At that time, I explained to them carefully about the message we wanted to deliver to the audience through the film to avoid them judging from only that one scene. 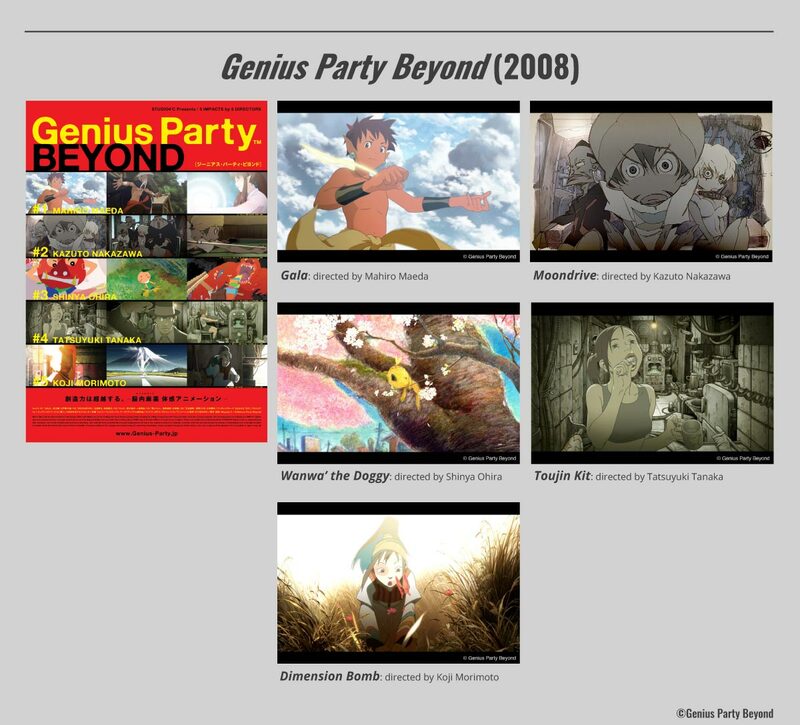 Eiko Tanaka: After Tekkonkinkreet, Genius Party (2007) and Genius Party Beyond (2008) were released. I think it is very hard and difficult for creators to show their unique universe in animation, so if they can do that, it would give them a high reputation, like Hayao Miyazaki, who is highly appreciated globally with the originality of his works. However, it is quite rare for creators to get a chance to show their originality in animation. I have hoped that talented creators can make what they truly want to create by showing their originality as artists. 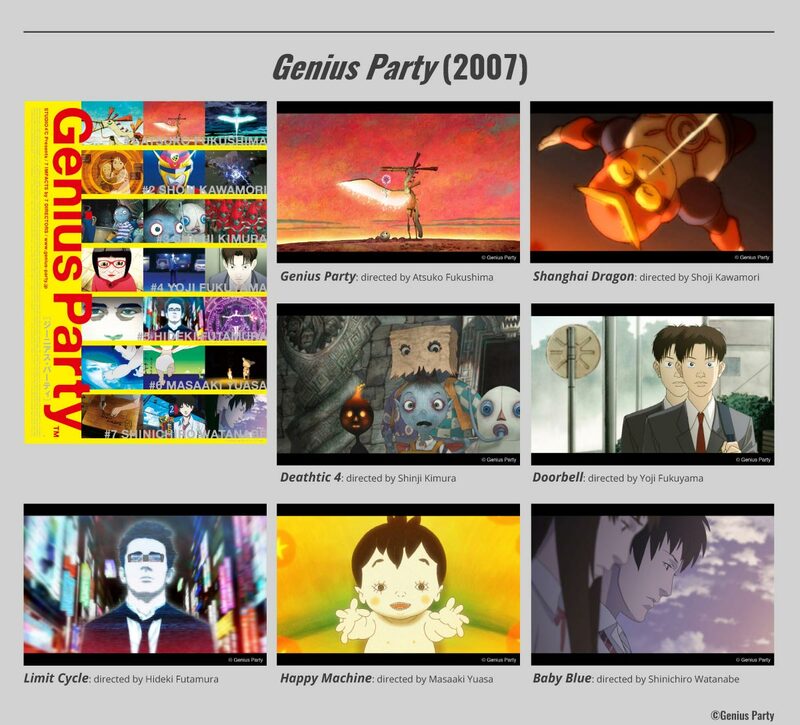 That was why we planned two anthology film projects, Genius Party and Genius Party Beyond. I suggested to a variety of talented creators of taking part in those projects, and we had them direct their original short films. Personally, I thought it was important to spotlight directors in the project, so we especially asked a professional photographer to shoot proper photos of them for the booklet of the two films, which were sold at theaters. We do not do that kind of thing normally. Among all the directors of the two anthology films, only the photo of Kazuto Nakazawa, who became famous with the animation part of Kill Bill, is not there because he was too embarrassed to show his photo (laughs). Hideki Nagaishi: After Genius Party and Genius Party Beyond, STUDIO 4°C developed First Squad The Moment Of Truth, which you mentioned a little bit before, right? 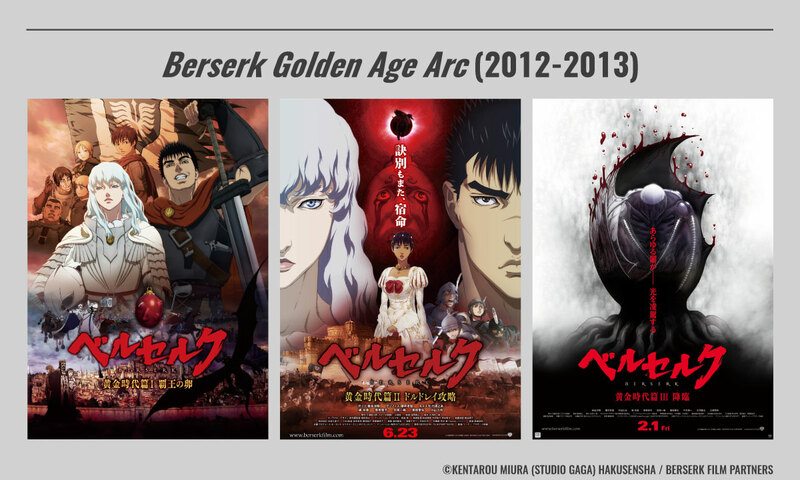 Eiko Tanaka: Yes, and the trilogy titled Berserk Golden Age Arc (2012 – 2013). We intended to express a deep and heavy theme in the original Manga series, so they became ponderous films in the end. The sequel project of the trilogy films was delegated to another studio. It became an appealing entertainment hero story TV series. When STUDIO 4°C was developing the trilogy, we were also making a 26-episode TV series titled ThunderCats, which aired in the USA, simultaneously. It was an international co-production with America, and each scenario of the TV series we received from the American team are sometimes shorter or longer than the actual total time of the episode. In that case, we needed to edit the scenario to fit the actual time for the program by discussing it with the American team. So, it was a really busy time for STUDIO 4°C. On the other hand, we could hear everywhere that Samuel Register, the president as well as one of the producers of Warner Bros. Animation, appreciated our work for the series. I think that’s how business connects to the future. 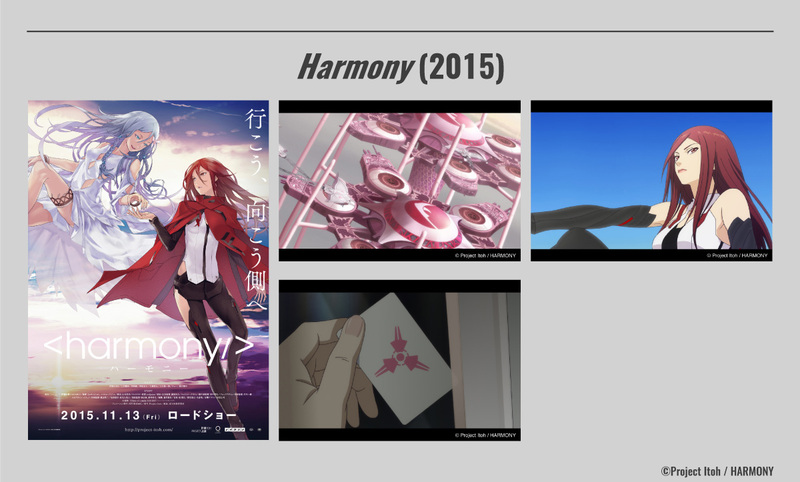 Eiko Tanaka: Then we made Harmony (2015), one of the three animated film projects that are all based on novels written by Project Itoh. Michael Arias and Takashi Nakamura co-directed the film. Here’s an inside story of the project: Little before we received the offer of the film project from Fuji Television Network, Inc., by chance Yusuke Hirota, who works for STUDIO 4°C, suggested a project plan to animate Project Itoh’s Harmony, the same novel, at our internal planning meeting. Because of that, we asked him to be an assistant director for the first time in his career when STUDIO 4°C decided to make the film.